New York Rangers President and General Manager Glen Sather announced today that the club has acquired forwards Darroll Powe and Nick Palmieri from Minnesota in exchange for forward Mike Rupp. New Rangers forward Darroll Powe has played in 294 NHL games with Philadelphia and Minnesota. A graduate of Princeton University, Powe was part of the Flyers' run to the 2010 Stanley Cup Final. Powe, 27, has skated in 294 career regular season games over five seasons with the Philadelphia Flyers and the Minnesota Wild, registering 28 goals and 28 assists for 56 points, along with 196 penalty minutes. The Saskatoon, Saskatchewan native has registered nine penalty minutes in eight games with Minnesota this season. He is tied for third among team forwards with five blocked shots. Last season, Powe ranked second among NHL forwards with a career-high, 91 blocked shots. He also established career-highs in games played (82), shots on goal (109) and penalty minutes (57). In 2010-11, Powe registered career-highs with 10 assists and 17 points, while leading the Flyers with a career-high, 196 hits. He skated in his 200th career game at New Jersey on April 1 of that season. In 2009-10, Powe notched a career-high, nine goals, and finished second on Philadelphia with 183 hits. He has also tallied one goal and four assists in 40 career playoff contests with the Flyers. The 5-11, 212-pounder made his NHL debut on October 24, 2008, as a member of the Philadelphia Flyers. 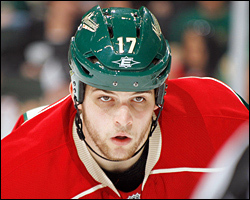 He notched his first career NHL point with a goal on December 9, 2008, against the New York Islanders. Powe originally signed with Philadelphia as an undrafted free agent on March 20, 2007. Palmieri, 23, has registered 10 goals and 11 assists for 21 points, along with 35 penalty minutes and a plus-12 rating in 40 games with the Houston Aeros of the American Hockey League (AHL) this season. He is tied for sixth on the team in points, fourth in goals, seventh in assists, third in penalty minutes, and ranks second in plus/minus rating. Palmieri has recorded five multi-point performances this season, including a two-goal effort on October 20 at Texas. Forward Nick Palmieri, who entered the NHL with New Jersey, has played 87 games in the league. He has 21 points in 40 AHL games so far in 2012-13. The 6-3, 220-pounder has skated in 182 career AHL contests over five seasons with the Lowell/Albany Devils and the Houston Aeros, registering 49 goals and 40 assists for 89 points, along with 135 penalty minutes. He established AHL career-highs in games played (69), goals (21), assists (15), points (36), shots on goal (148) and penalty minutes (36) during the 2009-10 season. Palmieri made his professional debut on March 21, 2008, at Norfolk, and recorded his first professional point with the game-winning goal in a 4-3 win on March 28, 2008, against Worcester. The Utica, New York native has also skated in 87 career NHL games over three seasons with the New Jersey Devils and Minnesota Wild, registering 13 goals and 12 assists for 25 points, along with 20 penalty minutes. He established NHL career-highs in games played (43), goals (nine), assists (eight), points (17), game-winning goals (two), and plus/minus rating (plus-nine) with New Jersey in 2010-11. Palmieri tallied an assist while making his NHL debut on January 20, 2010, against Florida. 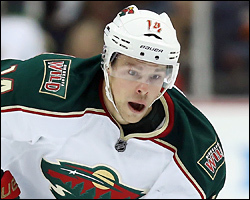 He was acquired by Minnesota, along with Kurtis Foster, Stephane Veilleux, a second round pick in 2012 and a conditional third round pick in 2013, from New Jersey in exchange for Marek Zidlicky on February 24, 2012. He was originally selected by the Devils as a third round choice, 79th overall, in the 2007 NHL Entry Draft. Rupp, 33, has registered 12 penalty minutes in eight games with the Rangers this season. The Cleveland, Ohio native signed with the Rangers as a free agent on July 1, 2011. He was originally selected by the New Jersey Devils as a third round choice, 76th overall, in the 2000 NHL Entry Draft.